Last year, the big change to the then-new iPhone 5S was the addition of a gold option. This year, Apple upped the ante by offering not one but two screen sizes — both of them larger than the 4-in. screen on last year’s flagship iPhone. Apple calls these Retina HD displays, but what they really are is a conundrum for iPhone users not accustomed to choosing a display size. Since the new iPhones (and the Apple Watch) were unveiled on Tuesday, I’ve been asked repeatedly about the new screens from would-be buyers. As it happens, I’m mulling the same question, since pre-orders begin tomorrow for the new phones, which go on sale Sept. 19. If you’re on the fence about which size is right, fret not. All you have to consider is exactly how you’ll use this phone, and which functions you’ll want most often. Both models of the new iPhone 6 line-up — the regular 6 and the 6 Plus — come in the same color and size configurations: silver/gold/space gray and 16/64/128GB. Both come with a new barometer sensor, support for faster LTE, support for 802.11ac Wi-Fi, NFC, and improved cameras. The difference is mainly in the screen. The iPhone 6 offers a 1334-x-750-pixel 4.7-in. LED-backlit display, which works out to 326 pixels per inch, just like the iPhone 5 and 5S. The iPhone 6 Plus has a 1920-x-1080-pixel 5.5-in. LED-backlit display at 401 pixels per inch. Both displays feature an LCD with dual-domain pixels for improved viewing angles and a substantially higher contrast ratio. Last year’s flagship iPhone 5S had an 800:1 ratio; the iPhone 6 has a 1400:1 ratio, with the larger 6 Plus offering 1300:1. The iPhone 6 Plus offers 88% more viewing area and three times the pixels on iPhone 5/5S. That’s two million pixels in total, and nearly a million more pixels than the iPhone 6. So if you’re mainly interested in pixels and screen real estate, the 6 Plus is for you. Note: It’s $100 more than the regular iPhone 6. While it’s one thing to have a large display, it’s another thing entirely when the software is optimized to take advantage of that big screen. Instead of simply scaling up interface elements, iOS 8 has been redone to take advantage of the larger screens, more so on the Plus model and especially when holding it in landscape mode. For instance, the keyboard on the Plus has extra keys, including dedicated virtual buttons for cut, copy and paste. And on the Plus, apps like Messaging, Email, and Calendar use a split mode to show you more information. The larger screen obviously means a larger size and a bit more weight, so, for some buyers, the 5.5-in. iPhone is just too large to be a comfortable fit in the hand. Measuring 6.22-in. long, 3.06-in. wide, and weighing 6.07 ounces, the iPhone 6 Plus isn’t the biggest phone on the market, but it certainly is the largest and heaviest iPhone ever released. Both iPhone 6 models are thinner than the iPhone 5. 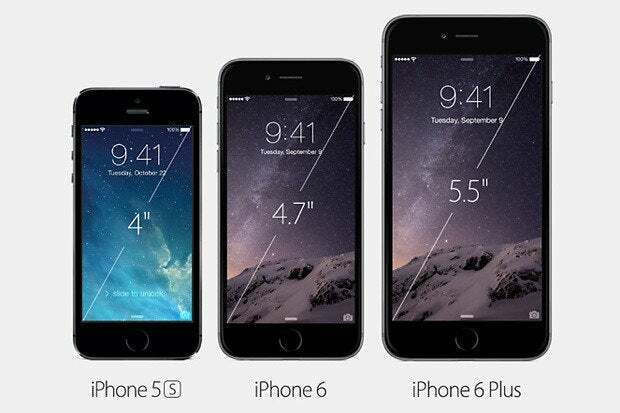 The smaller iPhone 6 is 5.4-in. long and 2.64-in. wide and weighs 4.55 ounces — heavier and larger than the iPhone 5/5S, but .03-in. thinner. (The iPhone Plus is only 0.2 millimeters thicker than the iPhone 6.) Since neither iPhone is available publicly in Apple Stores to check them out in person, the next best thing for the moment is to check out the various sites that offer actual-sized mockups. You can print them out and use them to determine how the new Plus model will fit in your hand, in your pocket, and against your face. Silly as it may sound, it’s better than guessing. To help compensate for the larger screen sizes, Apple engineers implemented a feature called Reachability, activated by a double-touch on the Home button. This feature shrinks the user interface towards the bottom of the phone and closer to your thumb. Ideally, that makes it easier to tap objects near the top of the screen while using one hand. So Apple says. I’ll believe one-handed use on the 5.5-in. model when I see it. 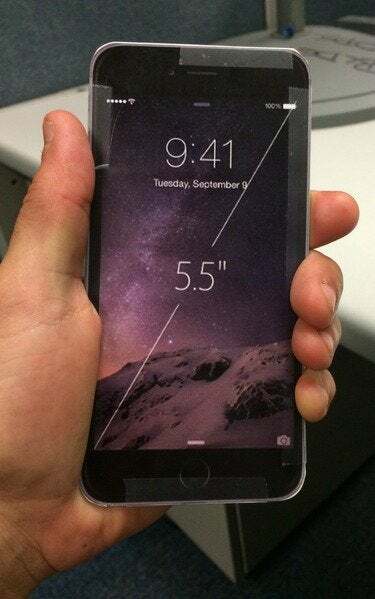 You can download mock-up images of the new iPhones and print them out to get a feel for the size. There are differences in the iPhone models besides the display that could affect your purchasing decision. 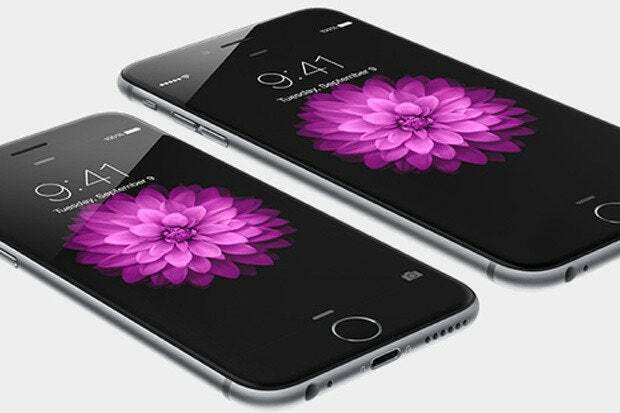 The iPhone 6 Plus also features a camera with optical stabilization, which should help in taking pictures and video. While the iPhone 6 also offers an improved camera, the digital stabilization feature isn’t as handy as the optical stabilization used in the Plus. The Plus model also has a larger battery, with a talk time of up to 24 hours on 3G and a standby time of 16 days compared to the iPhone 6’s 14 hours and 10-day standby. Video and audio playback as well as internet use is listed as 14, 80 and 12 hours on the Plus; 11, 50, and 10 hours on the 6. If the iPhone is still being used primarily as a phone — some people do that, you know — the decision could simply be whether you’re compfortable holding a large screen to your head. Phablet phobia thus makes the 4.7-in. model the easy call. Conversely, if you spend a lot of time using your phone to read, surf or check email and Facebook, the larger screen and longer battery life are a better option. If portability is the key, and if you already own a tablet or use a traditional computer for everyday tasks, the iPhone 6 should do nicely. Of course, smaller is relative; even though it’s dwarfed by the Plus, the iPhone 6 screen still has 38% more pixels than the iPhone 5. Personally, I’ve decided on the iPhone 6 in Space Gray with 128GB of storage; storage is more important to me than screen size and resolution — especially considering the pixel density of the Retina HD displays. Sure, the Plus may pack a million more pixels into the display, but there comes a point of diminishing returns, and since I’m on the go a lot, 4.7-in. model will be more pocket-friendly for hikes and trips. If you’re a fan of the iPhone, neither choice will leave you disappointed. In fact, I expect the larger screen sizes will lure new customers into Apple’s fold.